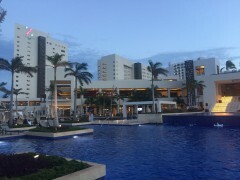 I, Robyn Ayers, Dream agent with Dream Makers Vacation Services arrived today at the Hyatt Ziva Cancun in Mexico. My family is joining me to celebrate both of our daughter’s high school graduation and 18th birthday. We flew on a nonstop flight from BWI on Southwest. We arrived in Cancun just after 2PM and breezed through customs and immigration grabbed our bags and headed out to meet our transfers. We booked private transfers through Lomas Travel before our trip. They are a destination travel company that provides transfers and excursions in Mexico. We were greeted quickly upon arrival and were off to the hotel which was only about 30 minutes away. The hotel is located in the heart of Cancun close to restaurants, nightclubs and shopping. The location is perfect with the hotel being surrounded by Caribbean Sea on 3 sides which offers wonderful views from almost anywhere. While I checked in my family enjoyed some tasty lemonade cucumber water while taking in the beautiful view from the lobby. We are staying in a Club Oceanfront Corner Suite. The room is wonderful and even has a hot tub on our huge balcony. The view from our room is fantastic. We have a bedroom, living room and dining area. Since we are staying in a suite we have access to the club lounge which has drinks and appetizers available all day and late into the evening. There is also room service available 24 hours. The club rooms are located in their own tower with an infinity pool and bar. Since we arrived late in the day we decided to enjoy the pool for a bit. The pool was quiet with no music or games. The main pool has all of the activities, music, etc. The beach in front of our room is very wide and beautiful. We were all tired so we spent the evening on the balcony and ordered room service. It arrived quickly and everything was good. We can’t wait to explore the rest of the resort during our stay. Thanks for reading about our first day at this wonderful resort. As always, please contact your Dream agent with any questions and to reserve your next vacation.